“Hard on the outside, soft on the inside” is how the Austrian newspaper “Verkaufen” (“Selling”) referred to Martin Limbeck. And this hits the nail on the head. 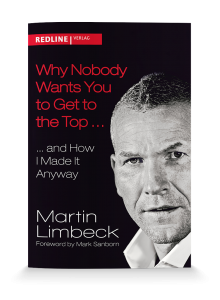 Apart from his dynamism, his occasionally brazen manner, his direct approach to others, and his image as a straight talker, nowadays Martin Limbeck is more multifaceted than he first appears. He spans an entire spectrum of emotions: Crystal-clear pronouncements, when they’re called for, but also many instances of empathy and warmth in addressing the challenges of his seminar participants and people in general. The family man comes from a coal-mining family in the Ruhr Valley in Germany and has remained close to his parents to this day. His loved ones include his wife Andrea, the dogs “Ego” and “Murphy” and his son Chris, whom he describes as “the greatest gift in my life” and with whom he shares a passion for soccer. Whenever possible, the three of them go watch a live game at the stadium, as their favorite team, Eintracht Frankfurt, fight their way up the division. His comfortable weekend house, situated on a lake near the Dutch border, is his haven. For 190 days of the year he’s on the go attending to his customers, and is seen by his employees, friends, and clients as a tireless and dynamic figure. However, he can also withdraw into the quiet setting of his boat and relax—whether or not the fish take the bait. But those who know Martin Limbeck, will also know that he’s got his sights on a particularly large predatory fish. Regular fitness training, occasional boxing, fishing, and driving his Porsche, but no less his “conservative, spiritual” side—as he himself has described it: Martin Limbeck proves that none of these facets are incompatible. Open-mindedness and versatility are his strong suits.